If you like colorful blooms that attract butterflies and hummingbirds, than you’ll want to take a close look at this drought tolerant beauty. Mexican bush sage has lovely gray-green foliage, white stems and velvety spikes of purple. It thrives in arid climates and provides glorious color spring through fall. You may be surprised to find that the actual flowers aren’t actually purple – they are white. Learn more about this drought tolerant beauty and why you’ll want to add it to your garden in my latest article for Houzz.com. I'm trying to grow this for the first time this year. I planted three small (approx. quart-size) plants in the spring in varying amounts of sun and shade. The one that gets the most sun is blooming now, although parts of the plant (certain stems) have died off. One in full morning sun and afternoon shade is probably doing the best, although it is not blooming yet. The one that gets the most shade (beneath a crape myrtle tree) looks healthy, but is only ~ 1/3 the size of the others. Any ideas on why I had the dieback on the one plant? S. leucantha is one of my favorite sages. I like the solid purple better than the purple bracts with white. It isn't ready to bloom here. Yet. I suspect that the branch dieback has to do with drainage…they need well-drained soil to grow their best. I recommend cutting them back severely in spring, once the danger of freezing temps have passed. You can lightly prune them as needed in summer. I hope this helps. I'd love to hear if they come back next spring! Ah, the dreaded poor-drainage problem strikes again. You're probably right. I lost a bunch of Hyssopus officinalis (true hyssop) in the same spot and (I think) for the same reason. Nonetheless, I'll let you know if any or all of my Mexican sages return next year! 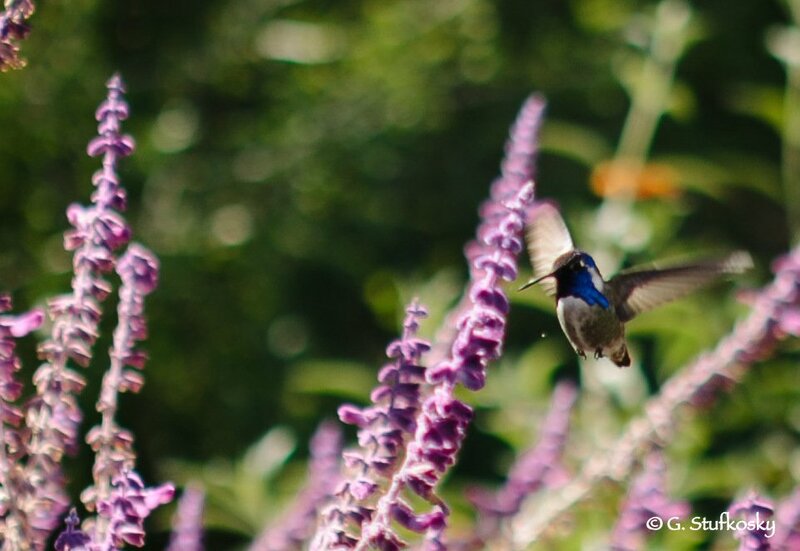 Small Space Garden: Hummingbird Paradise Goodbye Arizona…Hello Michigan!